In some cases, the 1970 Convention does not apply formally: either the States involved have not ratified this instrument or one condition if application is not fulfilled (as non-retroactivity). Other solutions are therefore sought so that Parties concerned can find a mutually acceptable agreement. Even if they do not reflect a strict application of the dispositions of the Convention, these solutions are often adopted in accordance with the spirit and the principles contained in this treaty. The Republic of Korea returned 11 dinosaur fossils that were smuggled into the country from Mongolia. A stolen Etruscan vessel will be returned to Italy thanks in part to the efforts of a hunter of looted antiquities. Last month, Christos Tsirogiannis, a Greek-born researcher who has spent more than a decade poring over auction and antiquities catalogs trying to identify stolen Greek and Roman artifacts, spotted an Etruscan amphora for sale at a Midtown Manhattan gallery. Two valuable paintings of former Dutch masters, despoiled by the Nazis in the late 1930s, were returned to the beneficiaries of a German Jewish art dealer exiled to Canada. The paintings, “Ships in Distress on a Stormy Sea,” by the marine artist Jan Porcellis (1584-1632), and “Landscape with Goats” by the animal painter Willem Buytewech the Younger (1625-1670), were recovered from an auction in Germany, which facilitated their restitution. The President of the Prussian Cultural Heritage Foundation (Stiftung Preußischer Kulturbesitz) handed over a 2,600 years old clay brick, with an inscription of the Babylonian King Nebukadnezar, to his Excellency the ambassador of the Republic of Iraq in Berlin. This object had been illegally removed from Iraq in 1975 by an individual, who had recently donated it to the Foundation. The Swiss Federal Office of Culture returned to the Egyptian Embassy in Bern, a batch of 32 ancient cultural objects, dating from the Pharaonic and Roman periods. Four of the returned items are extremely rare and of remarkable aesthetic quality: the bust of a king wearing a crown, a fragmented stele in honour of King Siptah depicting the patron goddess of Thebes from the era of the New Kingdom (approx. 1500-1000 B.C. ), and two architectural fragments depicting scenes of worship dating back to the Roman period (approx. 753 B.C. to 476 A.D.). The Archaeology Museum in Plovdiv, Bulgaria’s second biggest town, recovered in April 2015 a Roman Thracian silver mask and helmet, stolen in 1995 following an armed robbery. Following a successful investigation led by the Specialized Prosecutor’s Office in Bulgaria, the precious artifact was returned to the museum. The mask and helmet date back to 1st century AD, and belonged to a Thracian aristocrat from ancient Philipopolis (nowadays Plovdiv) in whose burial mound it was discovered in the early 20th century. During the visit of German State President Joachim Gauck to Peru an ancient ritual knife (“Tumi”) was handed over to the Government of Peru on 20 March 2015. The knife is around 800 years old and forms part of the rich cultural heritage of Peru. Probably it had been excavated illegally in the Lambayeque region. German authorities seized it in Berlin in 2013, where it had been offered for sale by an auction house. On 22 January, the Römisch-Germanisches Zentralmuseum in Mainz (RGZM) handed over to Italy a collection of grave goods, dating back to the 5th millennium BC. The outstanding complex with a precious jadeite axe head sheds light on an early European elite, maintaining long distance relations between societies in Italy, Germany, Luxembourg, France and the British Isles. The seven artifacts were looted from a tomb near Laterza in Puglia, acquired by the RGZM on the art market in 1986 and now returned to the Soprintendenza per I Beni Archeologici della Puglia, which already has plans for an exhibition. On 6 June, the state of Baden-Württemberg handed over two objects from the Cycladic culture – a marble figurine dating from 2700-2300 BC and a pan dating from 2700-2400 BC – to Greece. Both objects had been acquired by the Badisches Landesmuseum Karlsruhe in the 1970s and were returned in the spirit of the 1970 UNESCO Convention. An expertise conducted under the responsibility of the Ministry of Culture and Communication and the National Museum of Natural History of France made possible to determine that this statue seized in 2012 is a cultural object of the Nok civilization. This civilization appears in Nigeria in 1500 BC. and extinct at the end of the first millennium BC. J.-C., at the confluence of the Niger river and the Benue (center of Nigeria). This is a very advanced civilization, both in terms of its social organization and its refinement, at a time when the rest of Southern Africa entered the Neolithic era. Nok culture is considered to be the oldest terracotta producer in sub-Saharan Africa. The statue was stored at the Museum of Natural History in Paris, which took care of it gracefully. It was handed over by the President of the French Republic to Nigeria on the occasion of his travel on 27 February 2014. Thirteen ancient artifacts have been returned to Iraq, among them at least one object stolen from the National Museum of Iraq in Baghdad in 2003. Among the objects seized by German law enforcement authorities were eight cylinder seals of up to 5000 years of age as well as several sculptures. Respecting the instructions left in the will of a private individual, a group of heirs has conveyed a tablet of cuneiform script, that presumably originated from the Nimrod palace, to the Embassy of the Republic of Iraq, in Berlin. These 6 objects were seized in 2010 and 2011. An expertise conducted under the responsibility of the Ministry of Culture and Communication and the National Museum of Natural History of France, made possible to determine precisely the origins of these six statues dated from the Neolithic and the 11th-14th centuries. They come partly from the collection of the Esi Museum (State of Kwara) and are inscribed on the ICOM Red List. These works were handed on 14 July 2013 by Mr. Jacques de Labriolle, French Ambassador to Nigeria, to Mr. Yusuf Abdallah Usman, Director General of the National Commission for Museums and Monuments. In 2010, the Swiss customs discovered an exceptional Roman sarcophagus in carved marble, in a warehouse of the Ports Francs of Geneva. Following a thorough investigation by the Geneva Public Prosecutor’s Office, in collaboration with the Swiss and Turkish federal authorities, this magnificent object was found to have originated from an illegal search near Antalya, Turkey. Carved in the 2nd century AD, the sarcophagus represents the 12 works of Hercules on its flanks and weighs nearly three tons. It was found in the ancient site of Perga (near Antalya) , known today for its ancient theater, its long path lined with columns, its monumental fountain and its necropolis. Ordered in 2015, the restitution of the sarcophagus to Turkey was the subject of various appeals. After two years of mutual legal assistance, the Herculean sarcophagus will finally return to its country of origin. 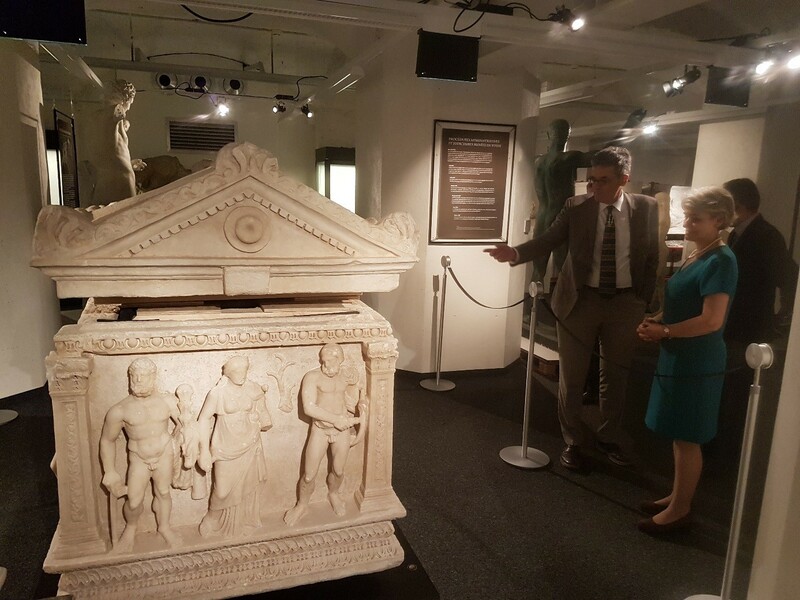 Before its departure for Antalya, the University of Geneva and the Geneva Public Ministry, with the agreement of the Turkish authorities, agreed to exhibit the sarcophagus in Geneva, during the summer, in order to invite visitors to reflect on the problem of illicit trafficking of cultural property. The ceremony of restitution, took place on June 19 2017 at the University of Geneva ; in the presence of the Director of the Geneva Museum of Art & History , the Rector of the University of Geneva, and the Minister of Culture of Turkey, H.E. 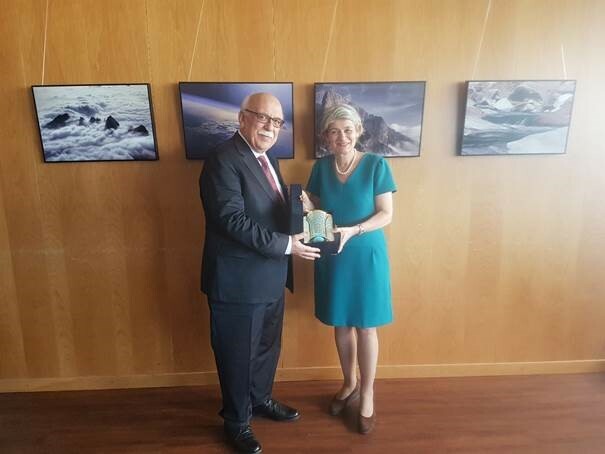 Professor Nabi Avci and UNESCO Director-General, Irina Bokova. The event highlighted the importance and effectiveness of UNESCO’s 1970 Convention on the Means of Prohibiting and Preventing the Illicit Import, Export and Transfer of Ownership of Cultural Property. “Illicit trafficking is a cultural and social scandal that deprives people of their history, their past, and therefore their future.The example of international cooperation between Turkey and Switzerland in this restitution shows also the great power of cultural diplomacy in building bridges,” stated the Director-General. This exhibition offers an insight into the life art of the ancient city of Perga. ” data-medium-file=”https://chasingaphrodite.files.wordpress.com/2017/09/council5feb08-352×224.jpg?w=500?w=300″ data-large-file=”https://chasingaphrodite.files.wordpress.com/2017/09/council5feb08-352×224.jpg?w=500?w=352″ class=” size-full wp-image-6085 alignleft” src=”https://chasingaphrodite.files.wordpress.com/2017/09/council5feb08-352×224.jpg?w=500″ alt=”council5feb08-352×224″ srcset=”https://chasingaphrodite.files.wordpress.com/2017/09/council5feb08-352×224.jpg 352w, https://chasingaphrodite.files.wordpress.com/2017/09/council5feb08-352×224.jpg?w=150 150w, https://chasingaphrodite.files.wordpress.com/2017/09/council5feb08-352×224.jpg?w=300 300w” sizes=”(max-width: 352px) 100vw, 352px” style=”display: inline; float: left; margin-right: 11px; margin-bottom: 2px; max-width: 100%; width: auto; height: auto;”>November 27, 1996: Symes sells the Bull’s Head for $1.2 million to Lynda and William Beierwaltes of Colorado, who display it in their dining room. While Symes assures them the object is authentic, as Bogdanos notes, “there was not a whisper-not even the faintest hint of a whisper about whether it was a lawful antiquity. Indeed, the lawfulness of the Bull’s Head (C-17) does not appear to have been part of any documented conversation between the Beierwaltes and Symes.” The Bull’s Head appears on the market “like Athena full-grown from the brow of Zeus,” Bogdanos writes, one of several flourishes in his filing. A Colorado couple has dropped a federal lawsuit that sought to stop the Manhattan district attorney’s office from returning to the Republic of Lebanon an ancient marble bull’s head that prosecutors said had been looted during that country’s civil war. The 2,300-year-old sculpture had been on loan to the Metropolitan Museum of Art until July when the museum turned it over to authorities after a curator raised concerns about its provenance to Lebanese officials, who requested its return. In an unusual twist, though, prosecutors said they are now pursuing the return to Lebanon of a second work that they discovered while recently reviewing a profile of the Beierwalteses in an old issue of House & Garden magazine. In a June 1998 special issue, Assistant District Attorney Matthew Bogdanos spotted an antiquity, “an archaic marble torso of a calf bearer,” in a photograph of the Beierwalteses’ home. Mr. Bogdanos said in a court filing that it too had been stolen from Lebanon. The antiquity, which depicts a person carrying a calf, was later sold by the Beierwalteses to a New York collector, Michael H. Steinhardt, in 2015. Mr. Bogdanos said in a letter that he sent to a state Supreme Court judge earlier this week that the district attorney’s office had obtained a warrant to seize the work. Mr. Steinhardt could not be reached for comment. The Beierwalteses had also sold the bull’s head sculpture to Mr. Steinhardt, who lent it to the Met museum. 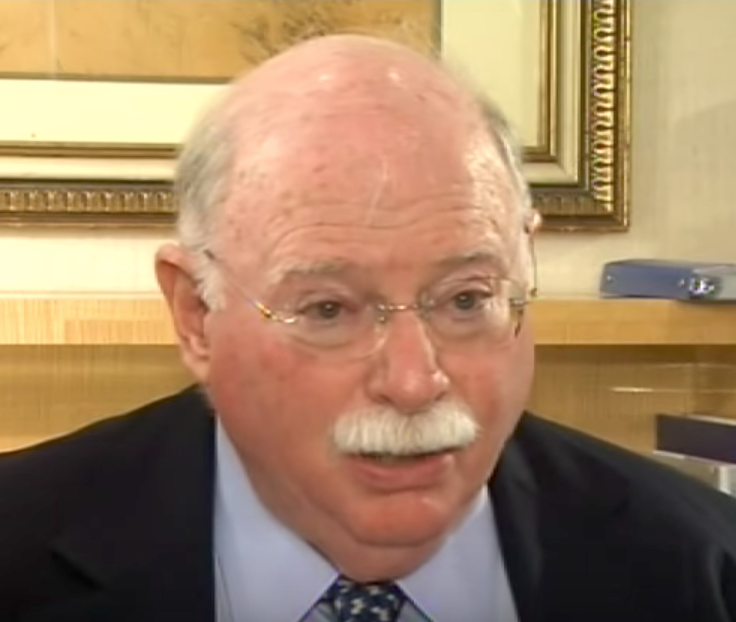 But, after learning about the provenance dispute, Mr. Steinhardt asked the Beierwalteses to take back the work and return his money. This summer the Beierwalteses sued the district attorney’s office and the Lebanese government, saying they had clear title to the bull’s head artifact and demanding its return. But Mr. Bogdanos produced evidence that the bull’s head had been discovered during a state-sponsored excavation in 1967 at the ancient Temple of Eshmun in Sidon, Lebanon. The item had been put in storage after its discovery and then was stolen in the summer of 1981 during the Lebanese civil war. It later turned up in the possession of Robin Symes, an antiquities dealer, who sold it to the Beierwalteses, Mr. Bogdanos said in his letter to the court. The calf bearer sculpture passed though some of the same hands as the bull’s head, according to the letter. It too had been excavated at Eshmun and was stolen from the Lebanese Republic, prosecutors said. It was then sold in 1996 by Mr. Symes for $4.5 million to the Beierwalteses, who later sold it to Mr. Steinhardt, Mr. Bogdanos wrote. 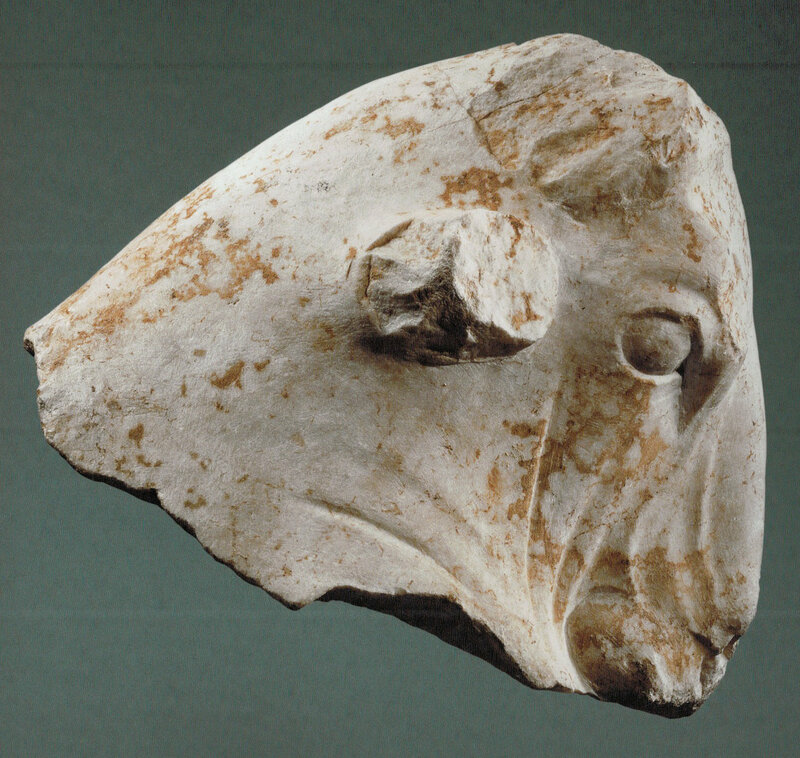 In further identifications connected to the recent seizure and pending repatriation of a Lebanese marble bull’s head, Assistant District Attorney Matthew Bogdanos through the New York authorities has issued another warrant on October 10, 2017 requesting the seizure of a second antiquity also believed to have been plundered from Lebanon during its civil war. Steinhardt’s collecting has come under scrutiny in the past. The warrant document further authorises law enforcement personnel to videotape and photograph the interior of Michael H. Steinhardt’s 5th avenue apartment as well as grants them permission to review stored electronic communications, data, information, and images contained in computer disks, CD Roms, and hard drives. The target group comprises of Lebanese, Syrian and Iraqi cultural heritage professionals with responsibility for, or experience, or expertise in acting against trafficking. The professionals will include archaeologists, archaeology professors and students, as well as law professors and students, and employees working for government authorities, universities, or in the private sector. The applicants will undergo a more rigorous interview process before selection based on merit. During January and February 2017, a similar training course was given to 23 individuals from Lebanon and Syria, from law and archaeological backgrounds. The participants were introduced to the issues, the market, international conventions and national laws, how to properly document and artifact and the role of public awareness. The Lecturers shared their expertise in different fields. Each lecture was followed by a 30 minute session for discussions, encouraging all members to participate. Group works were also assigned daily to encourage teamwork respect for the individual capacity of each participant. The overall objective was to help both nations by encouraging individuals to help their communities and local authorities protect their heritage. The final ceremony was attended by the Norwegian ambassador, the General Director of Antiquities of Lebanon, and the president of the International Committee of the Blue Shield. After identifying a stolen artifact, what measures should be taken to build a case for repatriation? The course will comprise two separate five-day “weeks” of intensive training by international experts on the matter. Simultaneous translation will be made available. Each invited expert will provide supporting written material. Participants are welcomed to present the situation of the trafficking of cultural property in their countries. At its successful conclusion, course participants will be awarded their certificate of attendance at a ceremony. At the end of the course, participants will be encouraged and supported to follow the market and try to repatriate or at least stop the sale of some objects identified in sales galleries or on websites through the preparation of clear and comprehensive dossiers that can be supplied to relevant law enforcement or juridical authorities.